Welcome to our newly redesigned web page, we hope that you like it. Thanks to the work of Carrie Spencer in helping to get the design done and get us live! The goal with the new page, beyond a little different look was to create a forum in which we can present new unique stories and additional detail beyond the tour. We still believe nothing beats a person tour with one of our volunteer guides, each with their own unique perspectives of the items within the home. Our web page then is an option to take that personal tour experience to the next level and continue your experience with the Harker family. For example, if you have toured the home in the past three years you may have seen the Civil War Sketches book, which was restored by the University of Iowa staff. This is one of my favorite pieces in the house and is a highlight for many people that have toured with me as well! 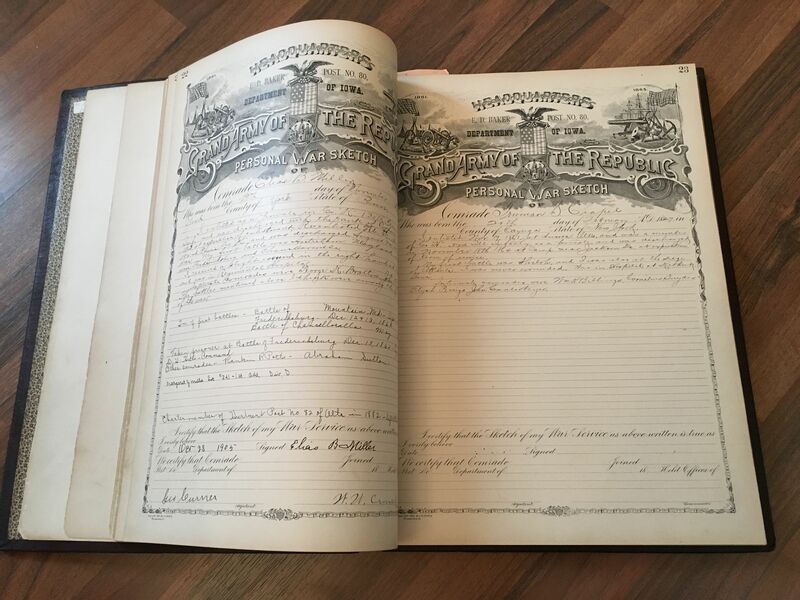 A normal tour however, doesn’t provide the visitor with enough time to really see the whole value of that book but now with our web page our visitors can read all of the individual sketches of Buena Vista County Civil War veterans contained within the book! Follow our blog. Check back here often to see the latest posts, learn new facts, and share your perspective and family stories in the comments to the individual posts! Like us on Facebook. We have had a Facebook page for a couple of years now and while we continue to build value on the page we invite you to “Like” us and share our page with your friends and family (encouraging them to “like” us as well). You’ll see more posts there as well along with pictures of unique items in the house or of Storm Lake History. There are lots of other exciting things in store for the Harker House in the upcoming months so stayed tuned! In the meantime go on Facebook and like and share our page (it’s easy to find at www.facebook.com/harkerhouse) and bookmark our web page so you can easily come back and see what’s new. Remember that our regular tour schedule starts in June and will run every Saturday and Sunday between 2PM and 3PM through August. Special tours can be arranged almost anytime during the year for groups, just give us a call or send us an email if you want to schedule something.